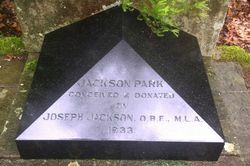 A stone in the centre of the arrangement of the Corridor of Oaks commemorates the conception and donation of the park by Joseph Jackson O.B.E., M.L.A. in 1934. 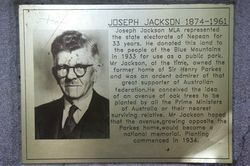 Joseph Jackson (26 November 1874 – 23 August 1961) was an Australian politician and a member of the New South Wales Legislative Assembly from 1922 until 1956. He was variously a Nationalist, United Australia Party, Independent and Liberal member of parliament. Jackson purchased Faulconbridge, the home of Sir Henry Parkes and donated a large tract of land (Jackson Park) to form a Prime Ministers' Corridor of Oaks. Jackson was a noted collector of Australiana and was awarded an Order of the British Empire (O.B.E.) 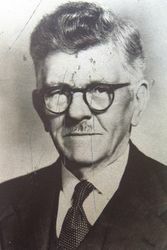 in 1957. 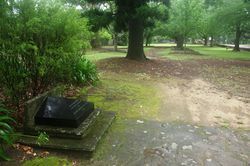 He was an alderman on Sydney City Council in 1918 - 1922, 1924- 1927 and 1930-1935, and the Lord Mayor of Sydney in 1931.